Producing milk without feeding cows any concentrates might be regarded as impossible. Yet some UK dairy farmers are doing so successfully. The Pasture-Fed Livestock Association (PFLA) has started to certify UK dairy farms producing milk from cows that are only ever fed fresh and conserved grass and pasture. It has been certifying 100 per cent pasture-fed beef and sheep farmers for the past three years. 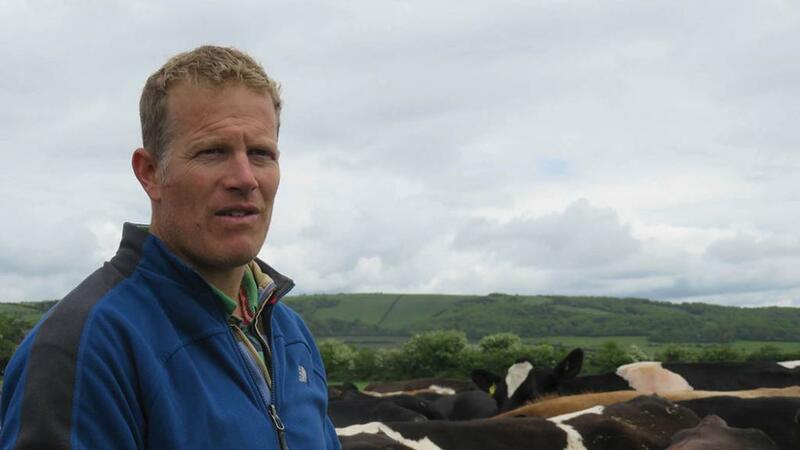 Russ Carrington, PFLA general manager, says: “While we recognise producing milk from just pasture is not easy, there are herds in the UK successfully doing this. The PFLA ran a pilot project in 2017 with eight farms including three micro-dairies (29 cows or fewer), two medium-scale farms (30 to 149 cows) and three large-scale farms (300 cows or more). The results showed costs of production were lower than conventionally farmed dairy herds, with no feed costs and often lower infrastructure and labour costs. While less milk was produced, ranging from 2,433 to 4,500 litres a year on average per cow, the higher quality usually achieved a higher price – ranging from 40p/litre when sold wholesale for cheese, to £3/litre for direct retail. “There are other benefits of Pasture for Life dairying,” says Mr Carrington. “The animals, which are often cross-breeds, tend to be in good health, so vet and medical costs are very low, and they are fertile, so replacements costs are small. “The milk is tasty and suitable for many uses, from cheesemaking to frothy cappuccinos or traditional liquid milk. 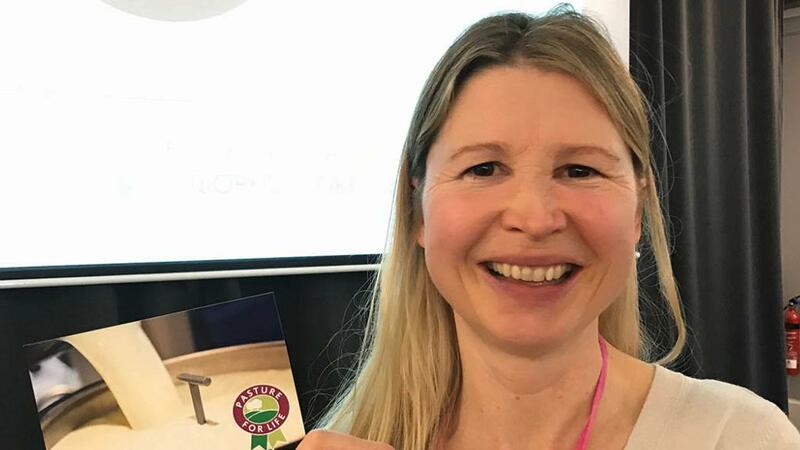 The PFLA is currently in talks with 26 other dairy farmers about becoming certified and aims to encourage the development of new routes to market for farmers to service growing consumer interest. and a separate herd of seven Jersey dairy cows. She farms organically and all the beef and dairy products she sells are certified Pasture for Life. The dairy cows are mob-grazed through 30 electric-fenced paddocks and are grazed with their calves at foot. The cows calve between March and September. The Jersey cows carry the A2 beta-casein gene and are individually machine milked once a day. For the first two weeks, the calf comes into the parlour with its mother to help milk letdown. The cows give an average of six litres of milk a day while still suckling. The heifer calves are weaned at five months old and the bull calves, which are not castrated or disbudded, stay with their mums until they are slaughtered for rose veal at six to 10 months of age. Ms Page says: “Our milk is tasty and nutritionally rich, with up to twice the amount of milk solids of conventional dairy products. “Being 100 per cent pasture-fed, it also has a better ratio of omega-3 to omega-6 fatty acids and more vitamins and minerals. “The cattle are grazing bio-diverse pastures, which helps build soil health. Healthy swards feed healthycows - I hardly ever call the vet. “Most of our customers come from a 10-mile radius to buy fresh milk, but some travel four hours to pick up frozen milk. I strongly support Pasture for Life. It shows how it is possible to produce nutritious food while supporting the environment. Ms Page helps other small dairy producers and runs courses on micro-dairy start-ups. 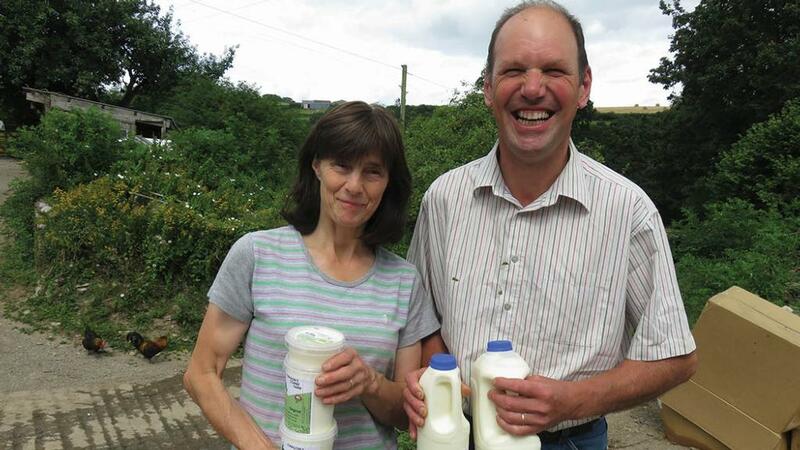 Peter and Mary Fish have milked at Challon’s Combe since 1993, taking over from Mary’s parents, who had owned the 57ha (140-acre) farm since 1958. They currently milk 50 cows, which calve all year round to give an even supply of milk and sell 60 per cent to Arla and process the rest themselves. Mrs Fish says: “We became certified organic in 2001 and put in a small processing unit, producing our first yoghurt in 2006. Mr Fish milks and looks after the cows while Mrs Fish makes yoghurt once a week and bottles milk twice a week. They spend a day delivering to a wide range of shops across south Devon, selling milk for £1 for two pints or £1.80 for four pints. “Customers really like the freshness,” says Mrs Fish. “We do not homogenise the milk and do not ever feed grains or concentrates to the cows – they just eat pasture. These two things make our milk exceptionally tasty and nutritious. “Being certified Pasture for Life makes a lot of sense to us. We never have to worry about metabolic diseases and getting the cows in calf is never a problem. Yielding 3,500 litres a cow a year, they are never stressed. All the calves are born without problems and are always fit and strong. “We started planting herbal leys a few years ago. In the drought nothing came through a recent herbal reseed, but since the rains it has really got going. Tenant farmer, Mat Boley, has run a low-yielding commercial organic dairy herd of 330 crossbred cows for the past 20 years. They are milked once-a-day and fed no cake. The cows and youngstock graze 223ha (550 acres) of organic perennial rye-grass and white clover pastures. They calve in a tight spring block starting on March 1, finishing eight weeks later. 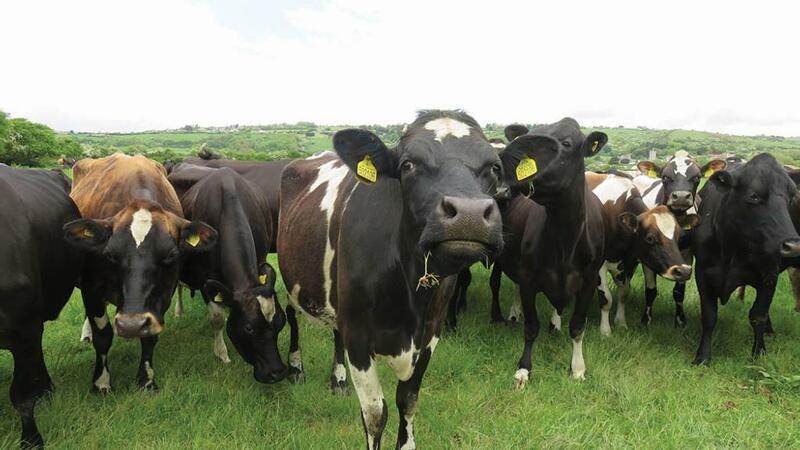 In a normal year, the cows produce an average of 280kg milk solids at 5 per cent fat and 4 per cent protein. One million litres a year is sold to Alvis Brothers at Bristol to be made into vintage cheddar cheese. The system is set up for one man to manage for eight months, with seasonal help for calving and serving. The cows are dried off in mid-December and most go indoors until calving, eating only hay and silage. This year, all the first cut silage was eaten during the drought and Mr Boley had to buy in organic hay for the winter. The cows rotationally graze the paddocks and Mr Boley measures the grass with a platemeter every 10 days. He says: “This has been the worst year for grass growth for 19 years. May was a good month and we made some very good silage which has now all gone. We had no rain for nine weeks, which for our system is catastrophic. The cows never reached their lactation peak. “Saying that, they are healthy and content and fertility is very good. “We are climatically very dependent, because we can’t go and buy a load of cake or a few acres of forage maize. Yields could be down to as low as 2,300 litres a cow this year, but with no added costs.